UNMIX::DRUMS is the world’s first audio plugin that allows attenuating or boosting drums in mixed music, in real-time. Using advanced source signal separation (a.k.a. de-mixing, unmixing, sound extraction, sound isolation) technology under the hood, UNMIX::DRUMS provides frequency dependent drum level control that ranges from up to +18dB of boost to virtually complete removal – while always sounding great. 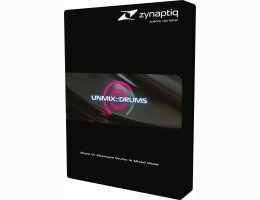 Whether used on a full mix or on a drum bus, UNMIX::DRUMS can be used to shape and enhance the impact of your drums in a unique new way.